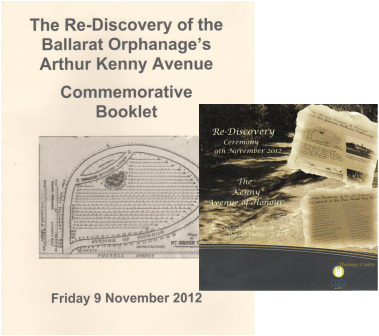 The Arthur Kenny Avenue of Honour - Ballarat District Orphan Asylum, Orphanage, Children's Home 1865-1980's Never Hidden Or Forgotten! In 1917, 200 pinus insignis trees were planed in honour of the orphanage boys who served in World War 1 at Mount Xavier reserve, two pipers played their bagpipes, the first tree planed was by Governor- General Sir Ronald.M.Ferguson , later named Arthur Kenny Avenue of Honour, sadly many of these trees today are almost gone, the track in which Arthur and orphanage lads created is still there today it's about one kilometer long to walk the track with pine trees plantation all that remains now around the Avenue. 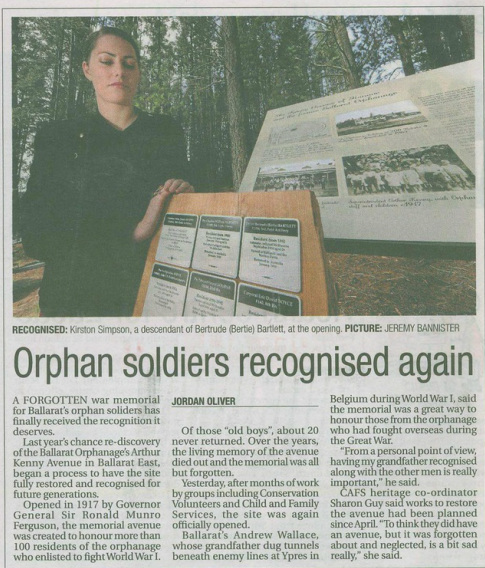 A forgotten war memorial for Ballarat’s orphan soldiers has finally received the recognition it deserves. Last year’s chance re-discovery of the Ballarat Orphanage’s Arthur Kenny Avenue in Ballarat East, began a process to have the site fully restored and recognised for future generations. Opened in 1917 by Governor General Sir Ronald Munro Ferguson, the memorial avenue was created to honour more than 100 residents of the orphanage who enlisted to fight World War I.Of those “old boys”, about 20 never returned. Over the years, the living memory of the avenue died out and the memorial was all but forgotten. Mr Wallace’s grandfather, Sapper James Wallace, returned to Ballarat where he raised a family. He said his grandfather received a bullet wound to the hand which restricted his career options later in life. “It was dangerous work, they worked in very small confined areas and there was lot of gasses underground,” he said. CAFS heritage coordinator Sharon Guy said works to restore the avenue had been planned since April. “To think they did have an avenue, but it was forgotten about and neglected, is a bit sad really,” she said. Many were only young boys to fight a mans war! Rediscovery Ceremony was held on Friday 9th of November 2012 emotional and successful event with over fifty people attended from family members of the soldiers, former residents of the orphanage and the Ballarat Community . While the signs are a permanent memorial at the Mt Xavier Avenue, the logs and plaques are in safe keeping at CAFS Child & Family Services Inc. Ballarat Victoria. A FORGOTTEN and neglected war memorial for Ballarat’s orphans is set to receive the recognition it deserves. The Kenny Memorial Avenue, opened in 1917, was created in Ballarat East to honour more than 100 residents of the Ballarat Orphanage who enlisted to fight in World War I. However, it has been all but forgotten for decades, with very few people in Ballarat even aware of its existence. Now a push is on to see it restored to properly honour those who fought for Australia. Driven by Conservation Volunteers Australian and Child and Family Services, the project will see new signs installed at the avenue to properly recognise its significance to Ballarat. Of the 103 who enlisted, exactly 100 orphan residents went overseas between 1914 and 1918. Twenty of them died in service. CVA heritage and research officer Roger Southern said the idea to restore the avenue was spawned when its history emerged. “We had people say it is Ballarat’s best kept secret and they couldn’t believe other people didn’t know about it,” said Mr Southern. “It’s quite an emotional issue for a broad number of people. It’s so interesting and something that should really be recognised.” Melbourne-based historian Frank Golding, a former resident of Ballarat, researched the history of the avenue and all those who were honoured. The avenue, which runs adjacent to the Mt Xavier Golf Club, is often used by mountain bike riders and walkers. Some of the trees that were originally planted in honour of servicemen remain, but most have been removed or fallen down and remain lying on the ground.